The issue, which presents itself when a user logs into Creative Cloud after installing the flawed 3.5.0.206 update, deletes the contents of the first folder to show up alphabetically in a user's root directory, reports Ars Technica. According to the publication, customers of data backup service Backblaze were inordinately impacted by the bug, as the company's hidden ".bzvol" root folder is alphabetically first for many Mac users. In the process of troubleshooting user errors, Backblaze confirmed the flaw by creating a hidden folder named ".a," installing Adobe's updater and opening Creative Cloud, a sequence that deleted the root file's contents. Perhaps more troubling is that many Mac users will find the ".DocumentRevisions-V100" folder at the top their root drive. The file includes data critical to autosave and version history functionality, the deletion of which could result in various system errors. "We are aware that some customers have experienced this issue and we are investigating in order to resolve the matter as quickly as possible," Adobe said in a statement. "We are stopping the distribution of the update until the issue has been resolved." In the meantime, Creative Cloud users are advised not to install the version 3.5.0.206 update or, for those who have already done so, not to log in. 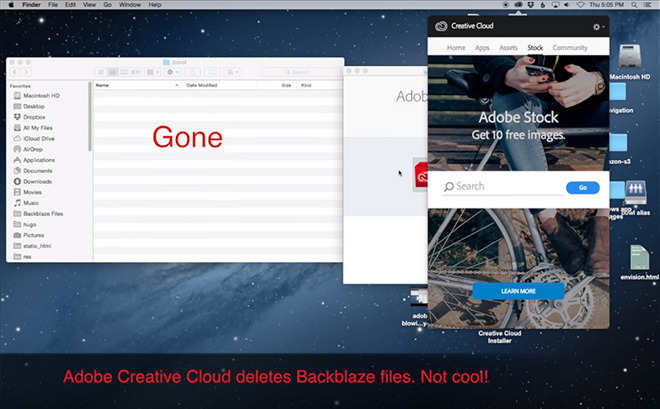 For users who need immediate access to Creative Cloud, Backblaze suggests creating a sacrificial folder and assigning it a name assured to be first alphabetically. Adobe has not offered an estimated timeline as to when the update will be fixed and subsequently re-released.